When sunlight strikes an object, the light reflected from it is scattered in all directions. When you point your camera at the object, a very small cone of the scattered light passes through the aperture and is directed onto the film by the lens. A point in the field of the camera’s view is said to be “in focus” if the cone of light reflected from it is collected once again to a point on the film. Two-dimensional schematic showing "perfect focus." Rays of light emanating from a point source in the field are brought once again to a point on the film plane. In practice, however, perfect focus is never realized because real lenses — even those made to the highest standards — are not perfect. Simply put, a lens is a curved piece of glass that bends light. If a ray of light entering the “top” of the lens is not bent by exactly the same angle as light entering the “bottom,” for example, a point in the field will appear not as a point on the film, but instead as a fuzzy disc because the rays of light arriving at the film will be spread out. This disc is known as the “circle of confusion” (CoC.) In two dimensions, it represents on the film the uncertainty in the position of a point in the field. Two-dimensional schematic showing the production of a circle of confusion by an imperfect real lens. 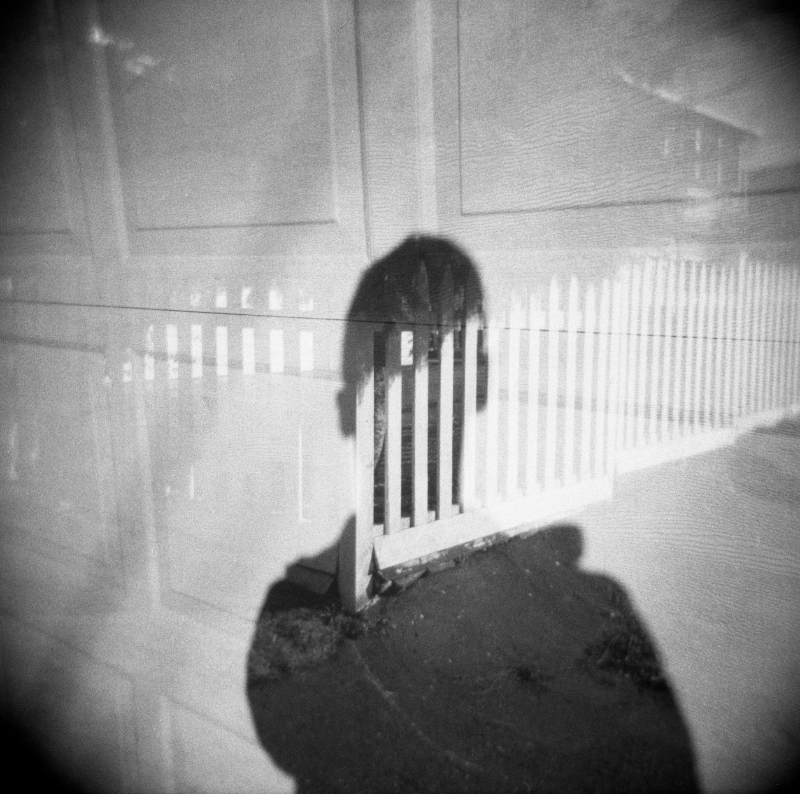 Rays of light emanating from a point source in the field are not brought to a perfect point on the film plane, but are instead spread over a small area by aberrations in the lens. The problem is compounded by fundamental laws of physics. The degree to which light is bent (or, “refracted”) by glass depends upon its wavelength (or, “colour.”) Red light is bent more than blue light. Therefore, when white light traverses a lens, its colours will be spread out in space, with red light being “focussed” in front of the film and blue light being “focussed” behind. Lens designers go to great lengths to correct this “chromatic aberration” but it can never be eliminated perfectly. Two-dimensional schematic showing axial chromatic aberration. Here, short wavelength blue light is bent less than long wavelength red light owing to a difference in their indices of refraction. The effect is that red light is focussed in front of the film plane, while blue light is focussed behind it. Once again, this uncorrected distortion leads to the development of a circle of confusion on the film. The visual acuity of the viewer. The distance of the viewer to the print. The degree of enlargement from the negative to the print. The better the eyesight, the closer the viewer, and the greater the enlargement, the smaller the CoC needs to be in order for the print to appear sharp. Because smaller negatives typically require greater enlargement to make useful prints, the CoCL will be smaller for smaller film formats and larger for larger ones. The important thing to realize about this list is that none of the factors has anything at all to do with the camera, or its settings, with the lens, with the film, with the scene, or with the moment the shutter button was pressed. All of them are considerations “after the fact.” Moreover, the photographer has control over only one of them, that is, the degree of enlargement. It should also be noted that all three of these factors affect DoF. Shown below (at top) is a recent photograph of my son, Michael, taken on a sunny day in the playground near our home. At bottom is a crop showing an enlargement of the field of view above his left shoulder. The complete image, reproduced at small scale, gives the impression that the whole scene is acceptably in focus. Depending on the quality of your screen, your distance from it, and how good your eyes are, you may be able to detect a slight softness in the "O" in the centre of the tic-tac-toe board behind him. This softness is immediately apparent in the enlarged crop. You may also notice that the features of his jacket are not quite as sharp as they appear to be in the small image. All of this is to say that the enlarged image has a shallower DoF than the small one. If you found this article useful, subscribe to receive occasional email updates. I respect your privacy. Your email address will never be shared. You may unsubscribe at any time. 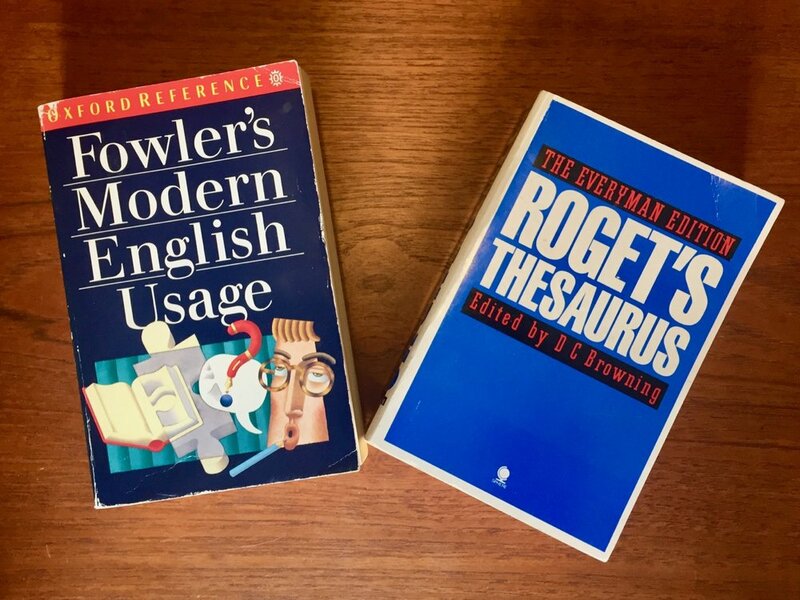 Twenty-five years ago, when I left Zimbabwe to study in Canada, my father gave me copies of Roget's Thesaurus and Fowler's Modern English Usage. He urged me to keep these books "at my elbow" and promised that, if I did, they would forever be good and useful companions on my journey as a writer. He was right. To this day, the two volumes lie within arm's reach of my desk and I find myself perusing them from time to time, even when I don't have anything in particular to look up. A dictionary and thesaurus are integrated directly into the operating system of my computer and my word processor truculently insists on correcting my grammar by placing squiggly green lines under my prose. However, neither of these digital systems, useful as they are, can match the delight I experience from Fowler's, which is wonderfully clever, opinionated, irreverent, and entertaining. Break open Fowler's to any page and you will be treated to entries like this one on the use of the word instance. Or this one on the distinction between principle and principal, which I reproduce here in its entirety. I love these books, particularly Fowler's. I hope that you come to love them, too. The following trends are likely to shape, directly or indirectly, how Vancouver's car sharing market will develop over the next decade. The action of these trends, together with inter-firm rivalry, make the market very dynamic. Maintenance of the status quo by any one of the incumbent firms (car2go, Evo, Modo, and zipcar) is likely to result in erosion of market and profit share over the long run. The City of Vancouver will become ever more densely populated, particularly as rezoning allows new mixed use, residential-commercial developments to concentrate along Skytrain arteries. These routes include the Cambie Corridor, which coincides with the Canada Line, and the planned Broadway Line to UBC. This crowding will put ever more pressure on parking and roadways and will make alternatives to car ownership increasingly attractive, especially as new city residents look to cut costs. Incumbent car sharing organizations should take advantage of this substantially increased demand. They should erect barriers against entrants that will inevitably be drawn to the industry by, for example, aggressively expanding their fleets. Changes in regulation will eventually permit ride hailing services, like Uber and Lyft, to enter Vancouver. In addition, it is possible that peer-to-peer car rental organizations, like RelayRides, will also take root in the city (see point 4, below). Traditional car rental agencies – particularly Avis, which owns Zipcar – may also begin to use slack capacity in their fleets for car sharing. The City of Vancouver will continue to expand its cycling and public transit networks. Developments of this kind will increase the number, variety, and power of substitutes for car sharing. Car manufacturers will increasingly enter the car sharing market with their own vehicles, either via wholly-owned subsidiaries, like Daimler/car2go, or via joint ventures, like BMW/DriveNow. Incumbent firms will need to harden themselves against the growing power of vehicle producers. As the internet of things inevitably extends into the car, both ad hoc and organized peer-to-peer car sharing will become increasingly common. The phenomenon will be driven by everyday car owners having continuous and remote access by way of mobile apps to many of the metrics that currently require expensive after-market hardware and specialized software. This information will be available either for free, or very cheaply, “out of the box,” that is, without complicated set-up. Metrics will include vehicle locations, engine diagnostics, and fuel levels, among many others. In addition, owners will be able to lock, unlock, and disable their vehicles remotely, which will obviate the need to transfer physical keys to renters and also provide a measure of security. Incumbent firms risk commoditization in the face of massive, decentralized supply, alternatives to driving, and vicious inter-firm rivalry. It will be essential for them to maintain perceived trustworthiness. This will mean, among other things, maintaining the highest standards of availability and reliability of their fleets, and being ever responsive to customer needs and complaints. Through the sharing economy, the Internet will effect profound and potentially disorienting changes that will reverberate in every corner of our lives. Ben Thompson, author of Stratechery, an influential blog about the intersection between technology and strategy, has written, “[T]he definition of ownership begins to shift. This will clearly first play out in automobiles: the long-run promise of Uber is a world where few [people] own cars and few cars sit idle. This will impact not just automakers but insurers, dealers, repair shops, and more. More profoundly, it will affect people. We will be less tied down, more willing to move, especially if our work becomes just as transactional as our possessions. And that, ultimately, will change the way we relate to each other, just as the shift from the small knit community in the countryside to the chaos of the city upended everything we thought we knew about how individuals, communities, and governments interacted." It is therefore not sufficient for incumbent firms simply to keep abreast of technological developments. They must also be exquisitely attuned and responsive to these changing cultural and social mores. See also: An Introduction to the Sharing Economy. The following introductory phrases are all too common in the mouths of our politicians and talking heads. Flashing red lights should go off in our minds whenever we hear them, for we are about to be treated to facile, one-sided generalizations that implicitly demand our consent. Who could possibly be opposed to the "truth" or the "facts"? We should also be deeply skeptical of sentences that begin with either "Look ..." or "So ..." The former is a sure sign that we are about to be patronized. The latter is either (i) an attempt to make whatever gibberish follows it appear to be the inescapable conclusion to a logical argument; or (ii) a clumsy, though effective, trick to change the subject. One of my personal favourites is to be told what I, and ALL members of my geographical group, want, as in "Canadians want ..." or "British Columbians want ..." – as if there were no diversity of opinion or desire. And then there is the combo platitude: "Look, the truth of the matter is that Canadians want ..."
This verbal sleight-of-hand is used equally on both sides of the aisle. We should never find ourselves nodding. Gnocchi with pine nuts and spinach, garnished with Parmesan cheese. Currently my daughter's favourite dish. The realization that it was both possible and reasonable for me to become a vegetarian surfaced exceedingly slowly in my conscious mind. Though I was deeply moved years ago by Schlosser's Fast Food Nation and Foer's Eating Animals, and had been considering a plant-based diet for over a decade, it wasn't until the beginning of this month that I finally decided it was time for me to stop eating meat. Desire for personal health and well-being. Specifically, I am a lacto-ovo vegetarian, that is, I do not eat meat, poultry, or fish, but do consume eggs and dairy products. I do not rule out the possibility of either narrowing, or expanding, these restrictions. This is an experiment. "Becoming" is the operative word. I have come to peace with the realization that my adopting a strictly vegetarian diet is a process rather than an abrupt transition, not because I personally lack discipline, or have an overwhelming desire to eat meat, but because I find it difficult to enforce my restrictions in family and social settings. Therefore, over the last month, I have eaten meat on four occasions; whenever I have been free to choose, or prepare, my own meals, however, I have always eaten plants. I don't consider this a failure, in either practice, or resolve. I don't feel hungry. I don't lack energy. I haven't lost weight. I don't miss meat. I'm comfortable with my decision and excited about exploring new kinds of taste experiences.